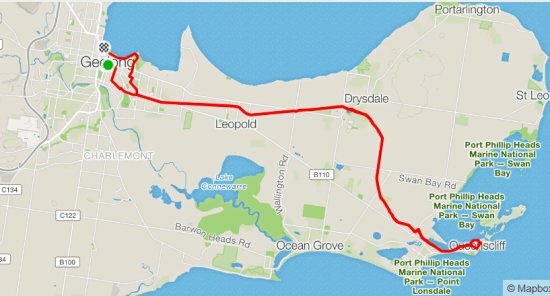 Well the first big ride on the new Mixte was Geelong to Queenscliff and back. This is me all set up ready to go. Not sure if you can see it, but when I bought the bike I upgraded to the Satori Animaris suspension seat post. I also put on the ergonomic grips. I also bought the Azur expandable trunk bag, but to be honest, I'm not a fan. It is held on with velcro and when I put on my Basil pannier bag, it tips over. I'll look for a better system, I think. Poor old Mr Aggy was using legs (like a fool 😃), so while I was enjoying an easy ride, he was pedaling hard and watching the track like a hawk, as it was a bit rough in spots. I was trying to ride on level 1 or on no assist on the way to Queenscliff, as I wasn't sure how the battery would go. 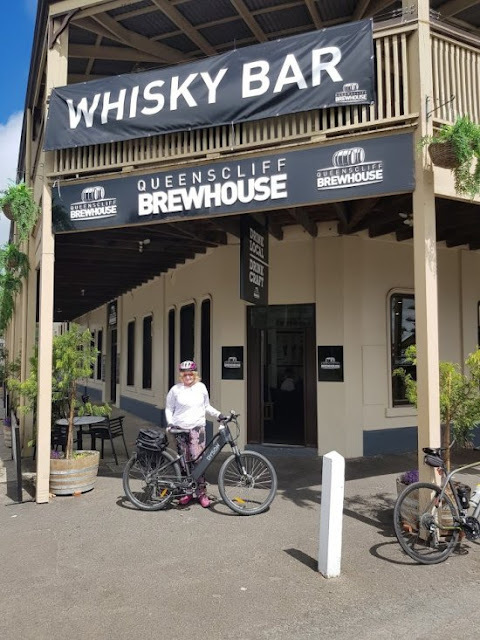 At Queenscliff, we stopped at the old Esplanade Hotel, now totally revamped as the Queenscliff Brewhouse. It has a number of different areas, one of which is a really good deli with local produce. There are a number of other areas as well as a whisky bar, for those so inclined, but this wasn't open. On the way back, we were riding into a headwind. Not so bad on the Mixte, but Mr Aggy found it annoying. 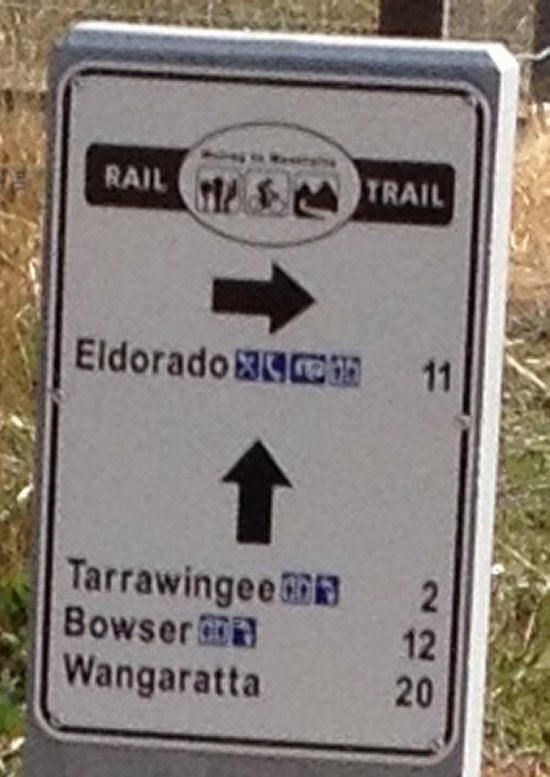 On the way back, I was riding mainly on Level 1 and Level 2 with some Level 3. As you can see, I could have used lots more battery as there was plenty left after 74.6 km. Well, it's been a while, but I finally got back into pedelecing, only to have my Gazelle die on me. First the battery charger went ($230) and then after one charge, the battery died. I was really annoyed by this and I decided not to spend another $1,000 on an old technology bike. 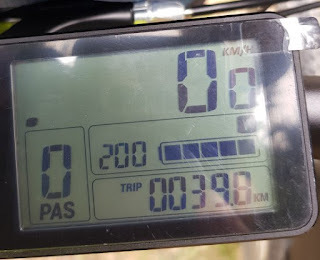 There was a total of 3500 km on the Gazelle odometer so it cost more than $1 per km - bummer! However, every expensive cloud has it's silver lining. 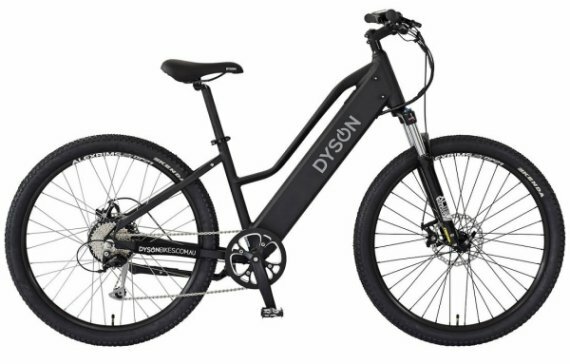 After researching ebikes, I bought a Dyson (no relation to the vacuum company) Hard Tail Mixte. 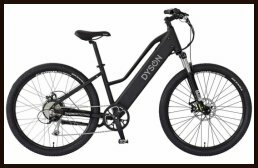 Here's the link here: https://www.dysonbikes.com.au/products/hard-tail-mixte.html. However, I upgraded to the 15 MA battery as I wanted the maximum range possible. It has mountain bike tyres. (Actually I wasn't sure about these originally, but they are really wide and very stable, so I am more confident riding, especially on gravel. It's tyres are easily changed, unlike the Gazelle. It is more like my non-powered bike. 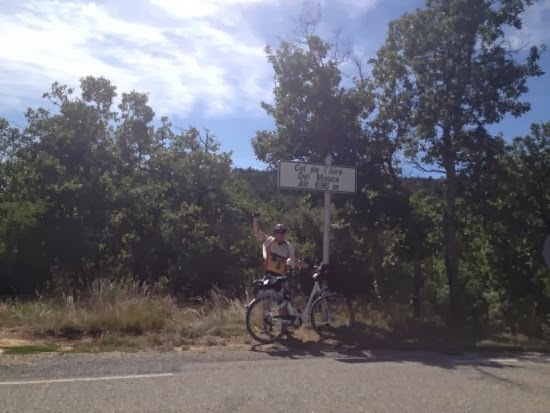 I think I mentioned that in September Mr Aggy and I did a fabulous trip in Provence by eBike. 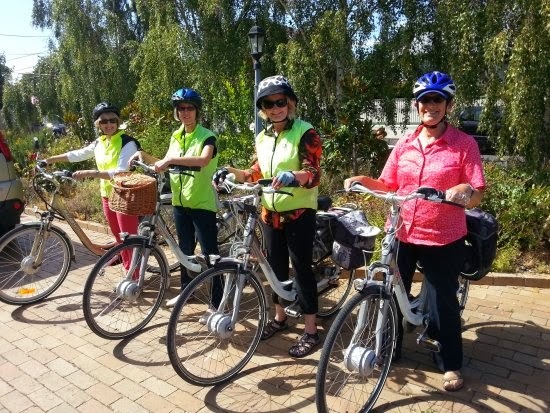 We booked the package tour through Sun ebikes. They were really helpful and Maxime of Sun eBikes customised a tour just for us. I really recommend this company. 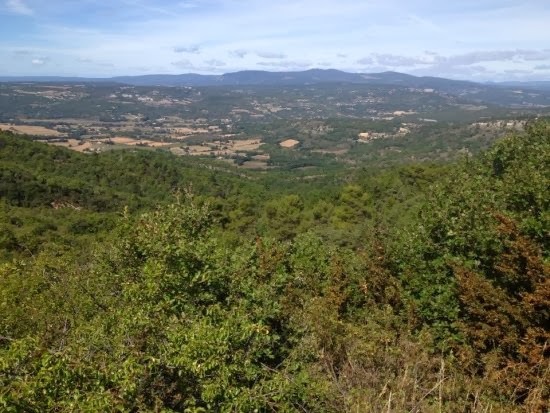 The tour left Bonnieux in Provence. Maxime had organised a pick-up from the Avignon train station and this all went smoothly. 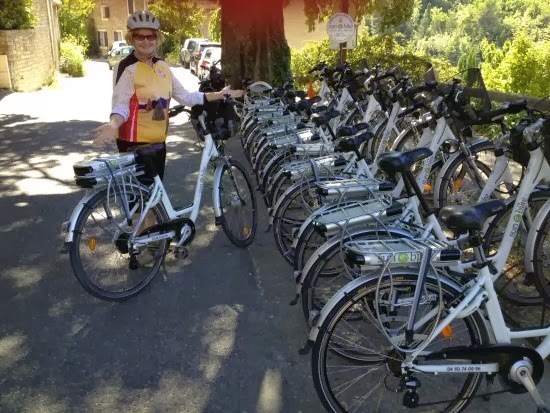 At Bonnieux there were rows of Peugeot eBikes set up for day tours and two bikes set aside for Mr Aggy and I. 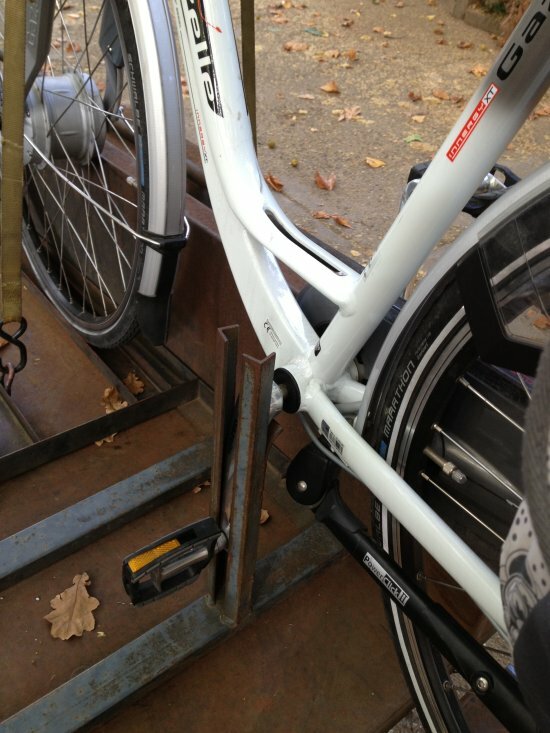 Note that the Peugeot eBikes have seven gears like the Gazelle, but they use a derailleur rather than the Hub gears, so I had to make sure I was in the right gear when I stopped. Sun eBikes have a great model for eBiking. They give you two batteries and a list of places with fresh batteries. You simply change your battery over around every 20 km. It is so easy and you never have range anxiety. 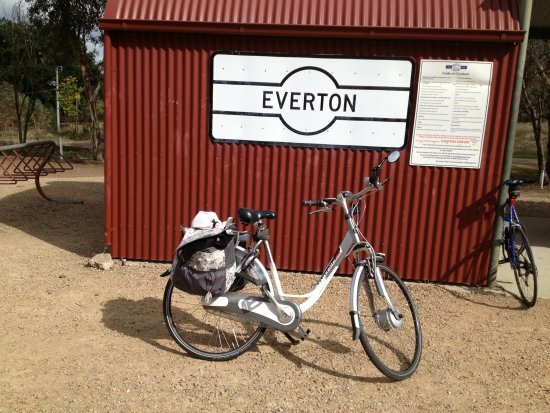 Mr Aggy and I were enjoying our eBikes as the route was very hilly and we were continually riding up and down. 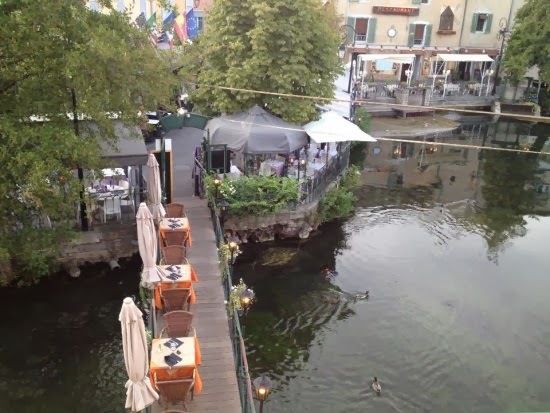 We ended up at a lovely town called L'Isle-Sur-La Sorgue which is surrounded by water. Our room at Les Terraces Du Bassin overlooked the river and a small bridge where we had dinner. The people who run this hotel were lovely and even lifted out heavy (locked) ebikes inside when it started to rain. You can find the Strava details of our ride here. Poured with rain on and off - but luckily every time it rained we were inside! 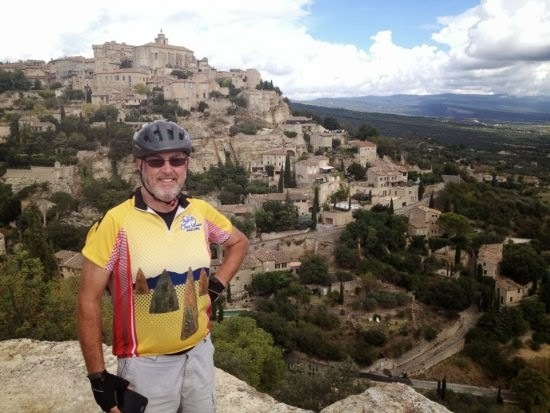 We rode to Roussillon today via Fontaine de Vaucluse (the source of the river Sorgue) and Gordes one of the prettiest villages in France at the top of a hill. The hotel that had been booked had double-booked itself but Maxime found us some marvellous alternative accommodation. We ended up in a 'room' with an upstairs bedroom with toilet, downstairs bathroom with shower, separate toilet and spa bath; outside our own private terrace (on the second floor) overlooking the valley and a heated outdoor spa! 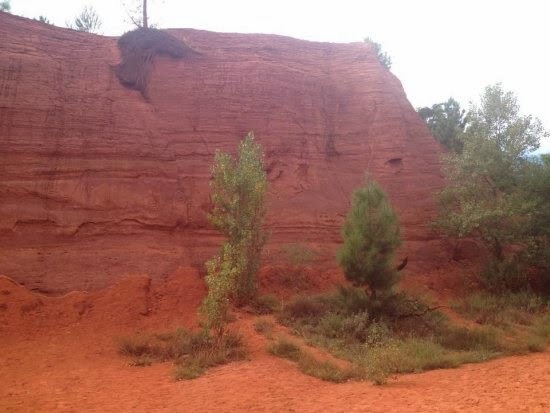 We started the day with a walk around Roussillon. This area is famous for its ochre buildings and ochre sands. We also tried to go down an ochre mine, but we missed the French tour and the English tour was too late. 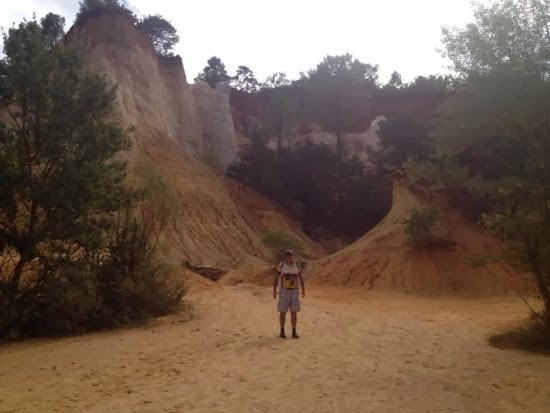 However later that day we rode to Colarado Provençal which has fabulous landscapes due to the over sands and lots if red rocks that looked a lot like mini Ayres Rock. 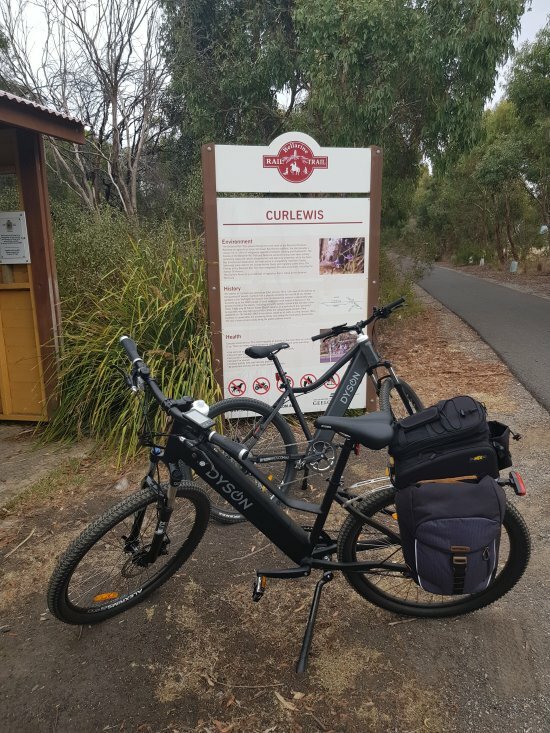 We really enjoyed the eBikes, they were perfect for the terrain and the Sun ebike company's organisation was excellent. 78.5 km today over massive hills and into a terrible headwind. 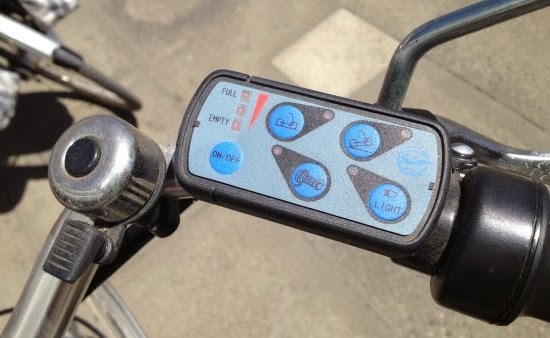 Good old eBike! 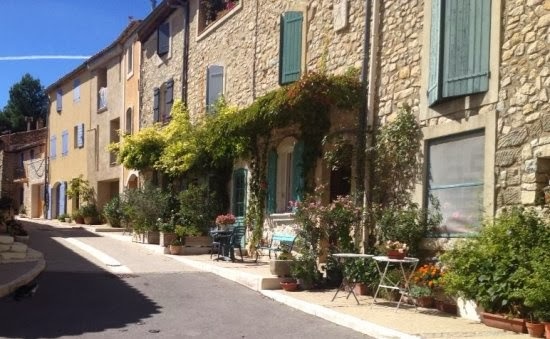 Our destination of Lourmarin was quite close to our departure point, but we went the scenic route! Mr Aggy at Col de L'aire Alt 696 m! Unfortunately on this final night, Sun eBike were let down by their choice of restaurant. The hotel restaurant was closed and they arranged for us to eat at. Restaurant No 9 in Loumarin. Food was terrible! If you have a chance to eat in Loumarin, don't eat here. The souffle was like a pancake. The two batteries tended to rattle, so we wrapped a coat around them. It would be better if they had a piece of thick rubber between each battery. Also, each bike had a large basket on the front. 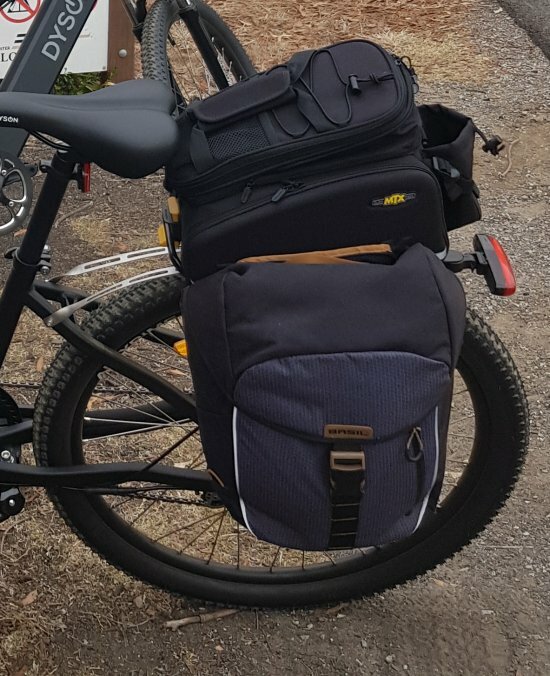 This is OK for day-trippers, but if you are riding all day, it would be better to have two panniers on the back. They are more stable and can hold a handbag and a coat and all the rest of the stuff you need. Tracey's sister's bike (soon to be Tracey's bike, I think) is not a Gazelle but a Flight bought from Goldcross. This seems an excellent bike. 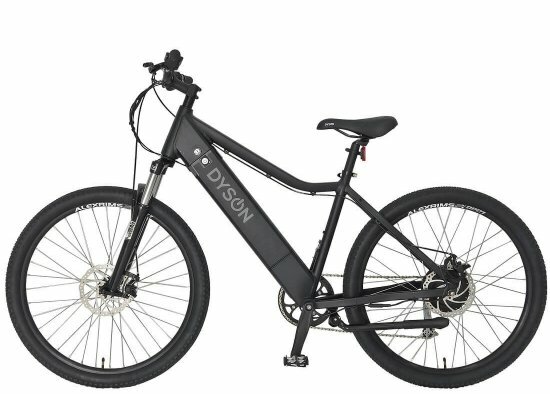 It is the previous standard eBike so it has a throttle, but it has hub gears and a torque pedal sensor plus a good battery (LiPo I think). Handy centre stand. Bought at a run-out sale by Goldcross at well under $1000 - bargain! Flight Bike - looks like a Gazelle! Flight Controller - two assist settings and three bars for the battery. I've had a look at the Goldcross site, but I don't think they sell electric bikes any more. Anyway, the four of us set off mid morning on a lovely sunny day. 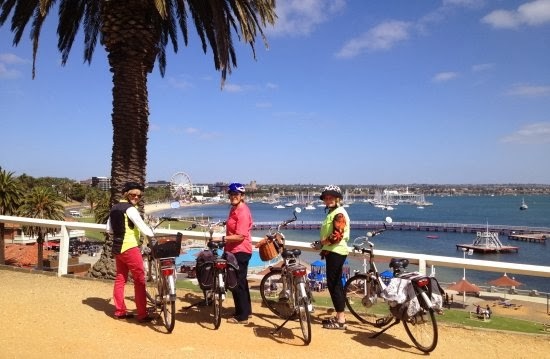 I had decided that since Elena hadn't seen much of Geelong we should do a Geelong 'showcase' and do a loop that included the Geelong waterfront and the Barwon River. After that we rode on to the waterfront and had a quick look over Eastern Beach. This is a really nice area with Art Deco kiosk and two swimming enclosures - the smaller one for children has just been renovated. 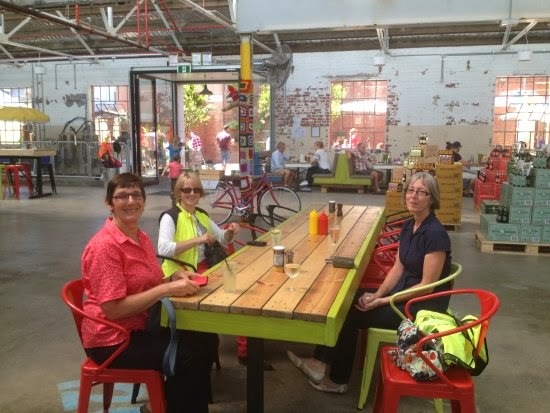 After the coffee stop, we rode for some time along the Geelong Waterfront. If you have a look at the Strava feed, you will see that there is a wonderful shared cycle path that runs right along the water. We then went to look at the Mill Markets - a large store with an eclectic mix of junk - but it was CLOSED! Mid week! Fortunately there was similar shop right next door so we got to browse a bit and speculate on who buys all this stuff. From there we had to negotiate a bit of the road to get to the Linear Trail that runs from Douro St up to the defunct Cement Works. There is a steep downhill on the road from there to get to the Barwon River. 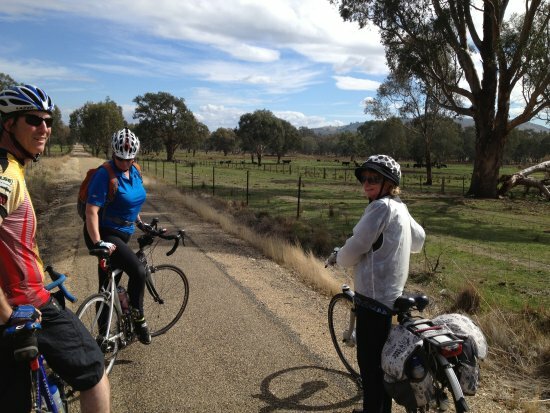 The river route was lovely and we ended up detouring off the river and cycling to Pakington Cottage for lunch. Nice lunch in the garden there at a reasonable price. (However I don't see too many positive reviews on Urbanspoon!) I'm not too keen on the toilet (one shared for the whole venue) probably 5/10. Finally we took the long route via Breakwater along the river to the new Little Creatures Brewery in Swanston St where we finished up for the day. Little Creatures Brewery is a huge new venue in Geelong with a very trendy feel and slightly too loud music (to my old ears anyway.) There is a great beer garden and a large inside area. Very bicycle friendly. Well worth a visit if you are in Geelong. But be warned - get there early on a Saturday or Sunday or else you may have to queue. Riding with no regard to battery conservation. FYI, Tracey's bike didn't lose a bar and she rode 41 km all up. Well, sorry about the long lapse in posts, but I've been busy! In August and September, Mr Aggy and I went overseas and did four different cycling tours. 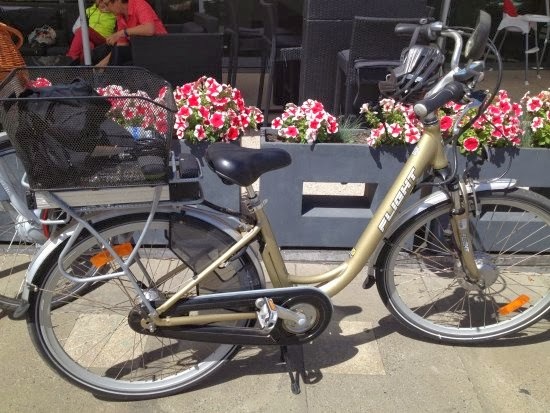 Three required the full use of legs, but the last was a four-day tour in Provence on electric bikes. Fabulous! Mr Aggy thinks this needs its own post, so I will give you the information later. So anyway, it's a new year and more rides are planned. 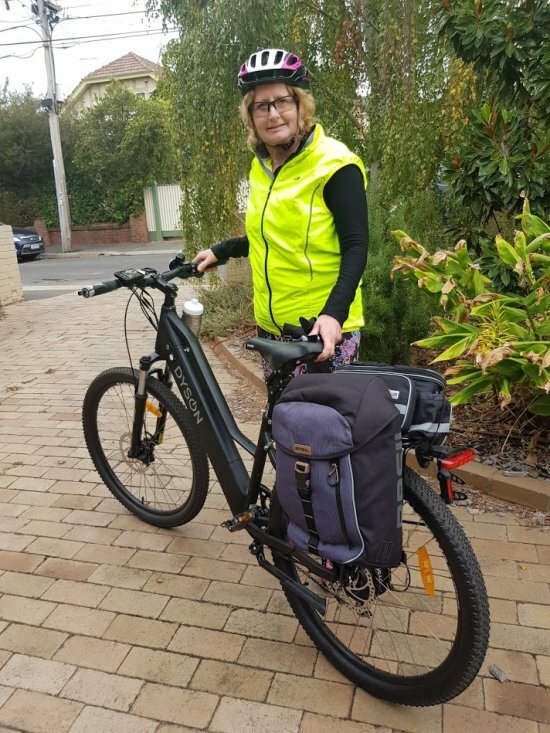 Those of you living in Melbourne will know that the suburban trains are having lots of upgrades in January and VLine is its normal disastrous self, so Jules has left her bike here with me in Geelong. I've always wanted to see if we could get to Queenscliff and back on the one Gold battery. Mr Aggy and I had previously ridden to Banks winery and back, so I thought it should be possible. So a couple of Wednesdays ago we set off. (Mr Aggy works from home on a Wednesday, so he promised to pick us up if we ran out of juice.) Wednesday was a lovely day, but with a very strong Easterly wind. 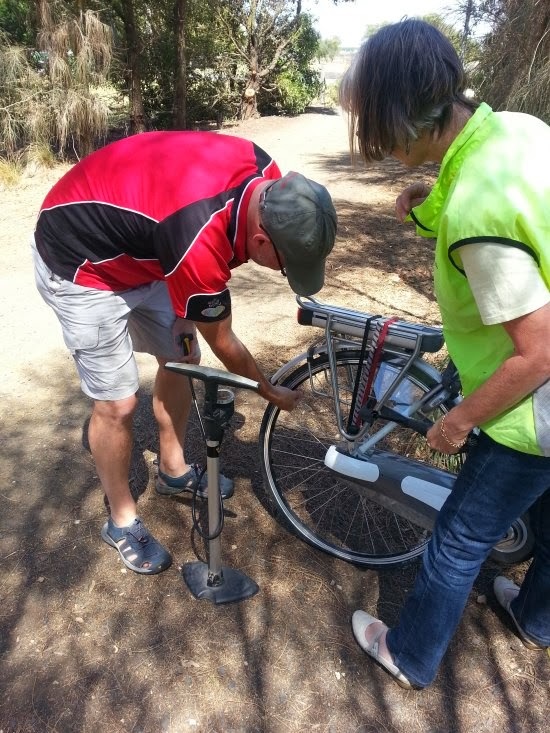 This meant we were riding into a strong wind all the way along the Bellarine Rail trail to Queenscliff. I had ridden my bike around Geelong a bit before the trip, but Jules hadn't ridden at all. 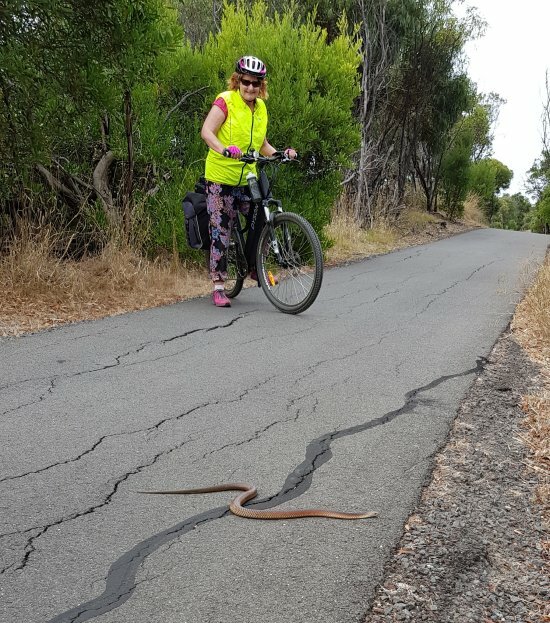 So a few kms into the ride we noticed her back tyre was a bit flat. Now I have to confess here that neither Jules nor I have ever pumped up a Gazelle tyre. So we took off the pump and Jules had a go - unsuccessfully. So unsuccessfully in fact that the tyre ended up completely flat. There was no way we could get it to pump up (especially since I told Jules to put the valve in the wrong way around!) Anyway we had to ring Mr Aggy who trundled out with the big pump and fixed us up. So, slightly delayed we set off again. Our first stop was Banks Road Winery and the Bistro at Banks. 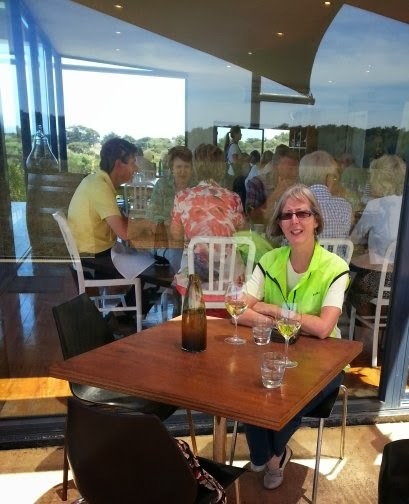 This is an easy ride up the road from the Bellarine Rail trail. We both had a glass of the Banks Pinot Gris - delicious. This place was packed for lunch, the staff were extremely friendly and nice and the toilet was a 10/10. I read that they have a seafood night on a Sunday night, so I'd like to go back with Mr Aggy sometime. At this stage we had done 28 km and lost one bar. Once we left Banks, it was just a short hop to Queenscliff and a late lunch at Charlie Noble cafe. We had dips and shared a pizza - really far too much food. Excellent value and the staff were really nice. At this stage we had done about 42 km - two bars down. So we started back quite late in the day. The wind had turned a bit, so it wasn't directly behind us - typical! Another issue is that Jules' bike is still not quite right. Her Boost is like my Normal setting and her Normal is like my Eco. So we swapped for a bit on the way back in order to try and make the distance. 1 bar on the Gold battery at 18 km, 2 bars at 33 km, 3 bars at 55 km. On Jules bike, the fourth bar dropped off at 75 km, on my bike I had 2 bars left. I thought I would update my replacement car trips counter. This records the number of times I have replaced a car trip with a bike trip. For instance, if I replaced a drive to the supermarket and back, this journey would count as two trips. I basically count it as a trip if I would have had to park the car and get out. As you can see, the distance is getting up. 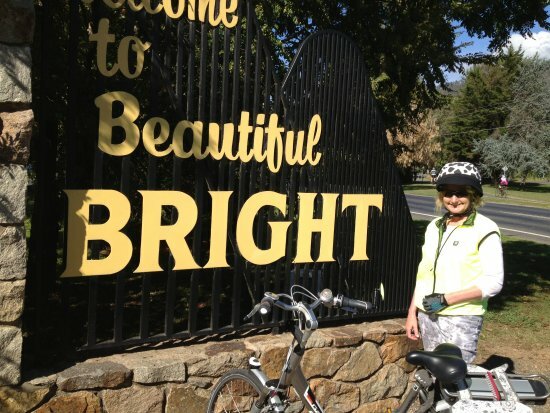 On Day 3, a ride into Bright was planned. It was another lovely day and the paved trail made for easy riding. About halfway we had a rest stop at Eurobin station. The ride into Bright - lovely! 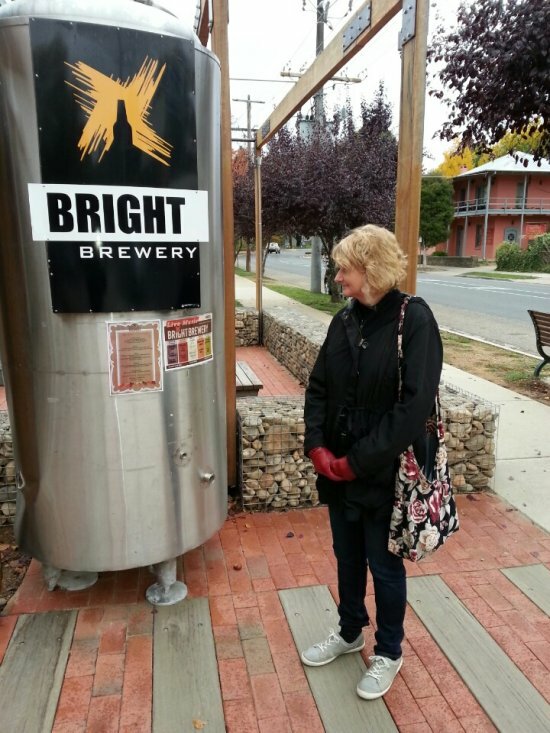 It is about 30 km into Bright from Myrtleford and we had a very enjoyable lunch sitting outside at the Bright Brewery. It was particularly nice as it was non-smoking outside, so for once we could have lunch without being surrounded by clouds of smoke. Bit of a cheat here - we took this photo the next day! After lunch it was about a 10 km ride back along the trail to Boyntons Winery. This is a really lovely winery with an outside eating area. 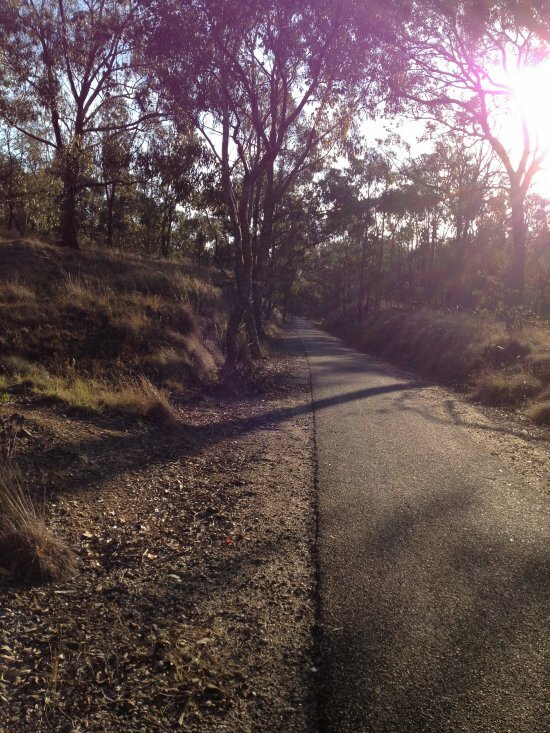 Finally a quick ride back to Myrtleford along a mostly flat track. Easy riding. Nice views on the way back too - great weather! 1 bar on the Gold battery at 40 km, no further bars used. Used boost a bit on the way back as I was stopping to take photos and then I boosted to catch up. 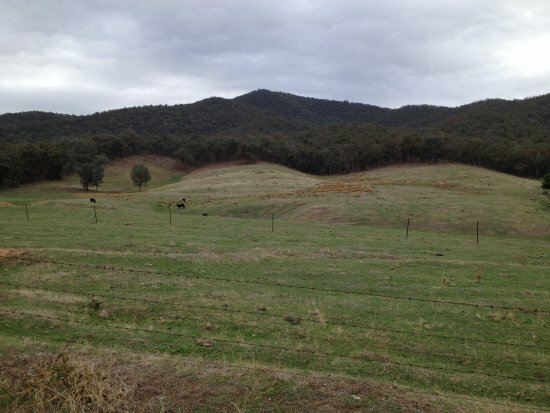 Quite a long ride was planned for our second day in the Victorian High Country. 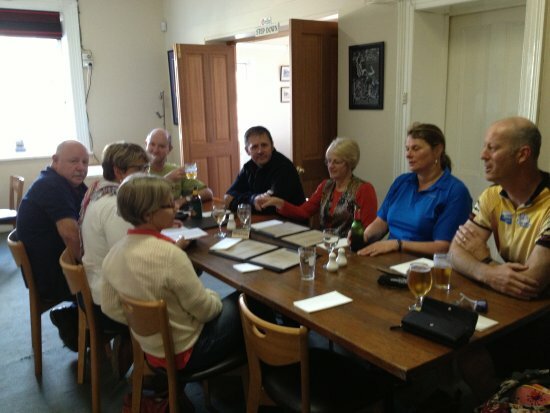 The lunch at Stanley was delicious and very convivial. Janet had done a lot of work beforehand and had organised a great menu. 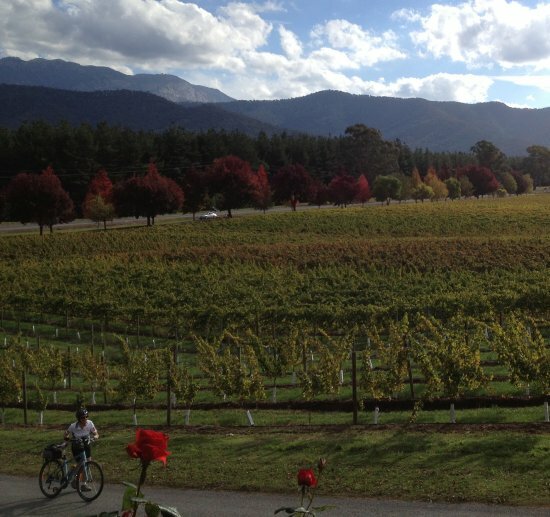 And after two filling courses and a few wines, I felt like taking a nap, not riding onto Beechworth. But on we went. Stanely Pub - very picturesque. 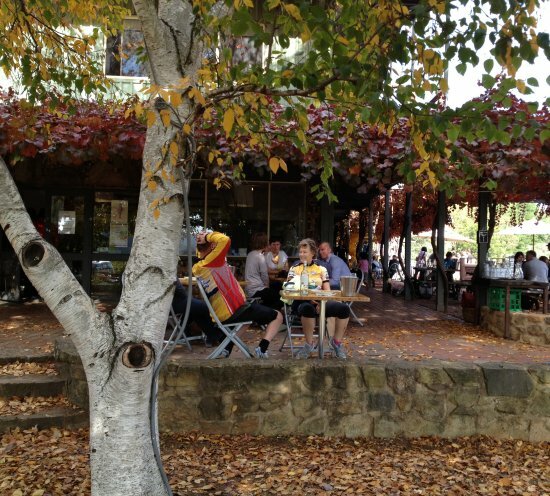 Beechworth is a nice touristy town and a good place for a stop. There was no winery there, but some of the group went to the Bridge Road Brewery. 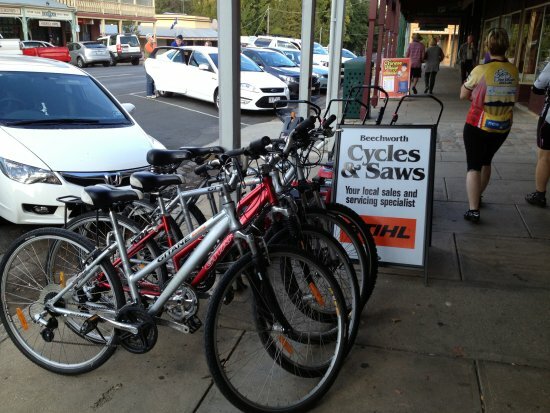 Interesting mix of products in Beechworth! Hard to see the downhill, but it was downhill for ages! The way back from Everton seemed to take a long time and it was dark by the time we arrived back at camp. Fortunately the Gazelle has built-in lights, so I just switched these on. There was only one major hill at Taylor's gap which we approached from the other side to the ride on the previous day. 1 bar on the Gold battery used at 38 km, no further bars used. 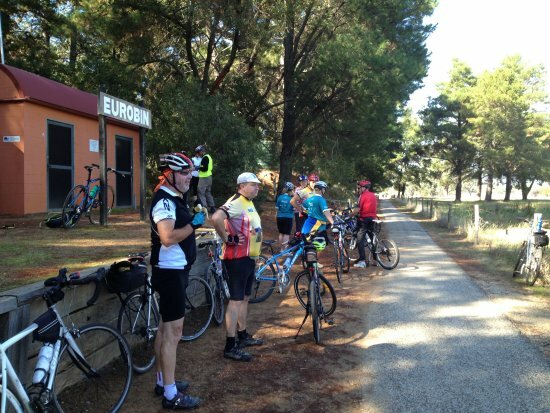 You will notice a bit of a theme to the rides - they all include a pub and a winery stop! I took both bikes on this holiday with the intention of riding the Trek on at least one day, but the lure and comfort of the Gazelle was too much, and I rode it everywhere. 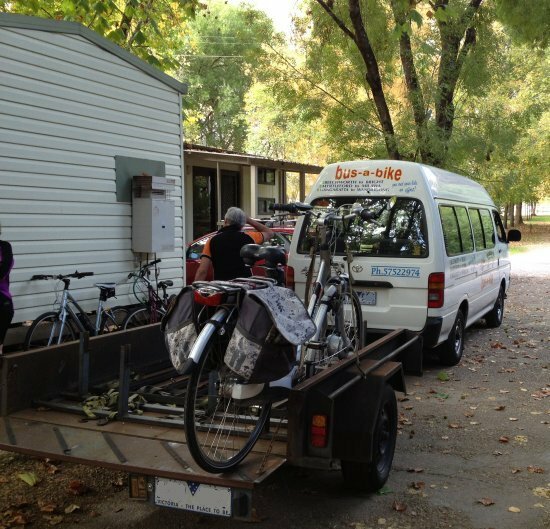 Our first ride was on the Murray to the Mountains rail trail from Myrtleford to the Tarrawingee pub where we were meeting up with some other members of our cycling group for lunch. 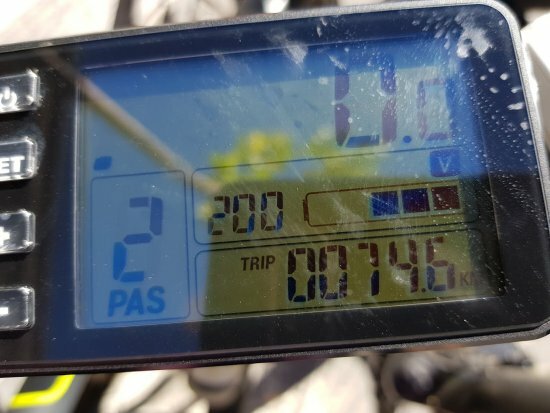 We estimated the ride to be about 40 km, and as a return trip seemed a bit much, Mr Aggy and Brad (Mr Janet) went up early in the day and left a car at the Pub so we would only have to ride one way. I hadn't been up this part of Victoria much and it was a beautiful ride. 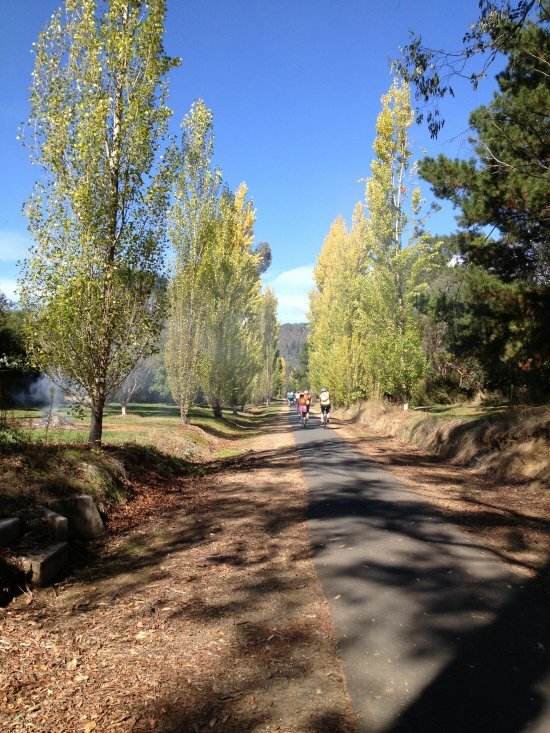 The leaves on the trees were changing colour and the bike track was excellent. It is paved all the way and very easy to ride (especially on the Gazelle!). There was only one major hill at Taylor's Gap, which the pedelec handled easily. 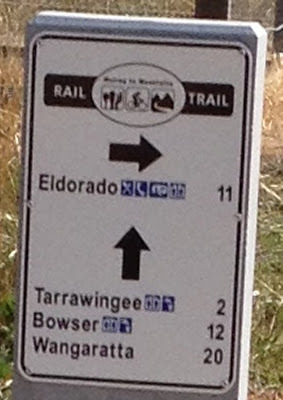 The trail is also well sign-posted, so you should not get lost. 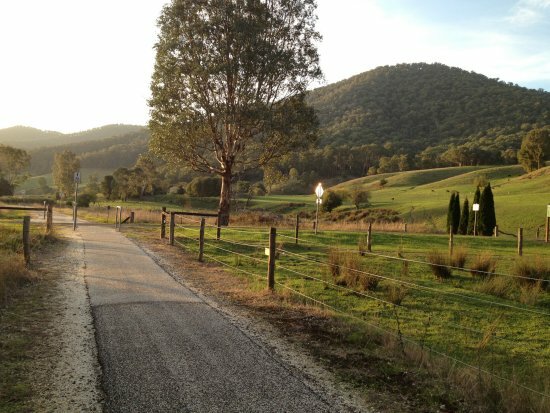 We had to ride the last few km on the road to get to the pub, but this was along a quiet road, so it wasn't a problem. 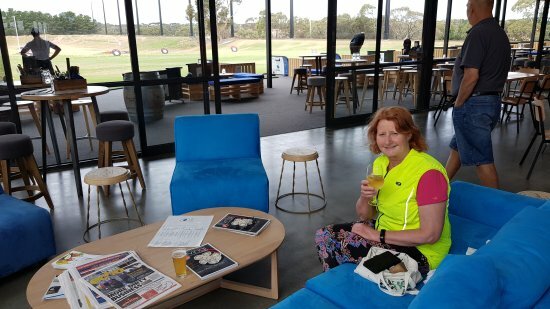 Although it was only 43 km, we were happy to get to the Tarrawingee pub (called The Plough Inn) and extremely pleased with our foresight in leaving a car there as we didn't want to ride back!. FYI, the Tarrawingee pub is nice and the publican is very friendly, but the food is a bit overpriced in my opinion. I had the scallops dish and had four scallops on the plate! Not much for lunch. Some of the cycling group at the The Plough Inn. On the way back from the pub we stopped at Gapstead winery. (I did say all rides included a pub and a winery!) 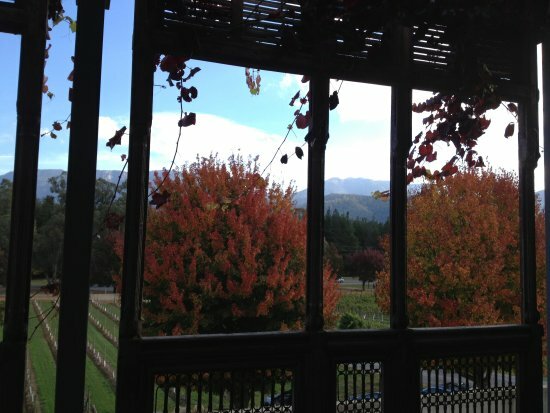 Very relaxing sitting outside there with a glass of wine on a beautiful autumn day.